A couple of weeks ago, a customer suggested me to paint a realistic painting composition of something like showing water. Well, this new fine art painting is the result. 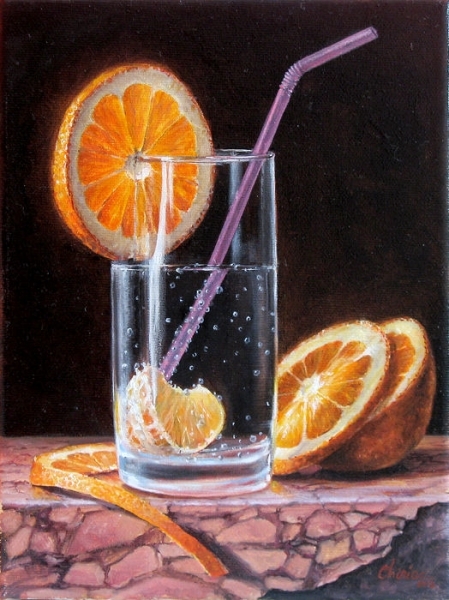 It’s a realistic still life painting of a glass of soda and a sliced orange. There’s also a piece of orange in the glass, too. The size of this oil painting on canvas is 18×24 cm / 7×9.5 inches. Sides are staples free and painted dark brown. Here’s a link to a YouTube clip I made showing this fine art painting in progress. great painting! It is perfect and highly developed art, to paint “water” , a translucent medium, only by its light reflectios! Shipment is always fast and safe – in summary: a great and skilfull artist and a very reliable seller! Many thanks!! I thank you Wilhelm! Thank you very much!